A note on my 'bet of the week' column (on the right)... Up until now I rarely bet on anything but often thought it might be easy to win some small money on the English premiership... after all, if you go for Man U, Chelsea and Arsenal most weeks, you are bound to be on a winner? Well, much to my disappointment, this doesn't seem to be the case. For starters, I only bet a fiver ever week and will continue until my stake of €50 is reduced to zero (which will happen in ten weeks if my current form of nothing from three bets continues). To date, I have been let down by Chelsea, Man Utd and Arsenal. If you can't trust these boys, what hope is there! I am betting on trebles, meaning that I need all three predictions to come right before I win. So far, my best week has had one out of three correct. Poor. This week I am going for Wolves to win away at Bolton, Man City and Chelsea to draw and Stoke to draw at home to Arsenal. €443 if it comes through. I hold out no hope, as my initial optimism has been replaced by that age old adage - the bookie always wins. Here's to the road that brings me nowhere fast. Well, not that fast. It takes twice the work to run half the pace on a treadmill but at least it gets me running here in the wilds of Connemara on those evenings when it is too dark or wild to go outside. I did a few miles today, just to keep me ticking over. Paid nearly a grand for a treadmill when I moved out here, and though it is truly a boring way to run I would like to raise a drink to the humble treadmill (a lemonade that is...). It may have no hills, no scenery, no fresh air and no spring in its' step but the treadmill is a friend to us country bumpkins with lightless roads.... Hurrah for rubbery roads. The Wogans were in town this weekend. Carol, Benny and the kids treating us to some 'wee' company down here in the West. I decided to bring Benny and my spanking new runners out to Seanféistín this morning for a three miler but the fog was so heavy that we decided to have breakfast first. Big mistake. Sausages, eggs and mushrooms were consumed less than an hour before we set off running and thank God that it was a Sunday, or else the belch police would have the two of us locked up for a few years. Had it not been for my new runners there is no way that I would have kept up with Dunleer's greatest goalie but I managed to hang on and so we completed this run with whatever dignity we could muster. 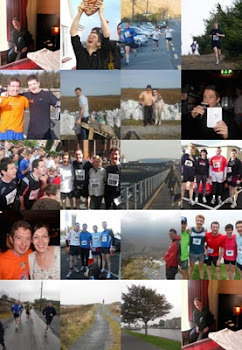 Benny has signed up for the Boyne Valley 10k on May 2nd... it may occasion a random pint. First new runners of the year... Asics of course. Will go for a run in Seanféistín tomorrow to break them in. The McKeowns were in town so I brought the victorious captain of the Louth County Champions of 1996 - (the Joes of course for anyone ignorant enough not to know their Louth senior championship role of honour) out to Seanféistín for what I thought would be a four mile run (turned out to be 7.5). The last time I ran this route I felt like a man giving birth to a baby cow going up some of the steep hills, but I got on a bit better this time. The wee man ('wee' referring to Louth - he is at least twice the size of me) ran with me for the first four miles and then cut loose for the last 3. In no time at all he was a spec of dust on the horizon. What are they feeding these lads in Dromiskin? Pic: The former captain himself, Enda, feeling the effects of the Tuam 8k, with Rónán in the background and D to the fore. Here's a pic from the torturous Annacurra run - thank God they got me going downhill instead of up! 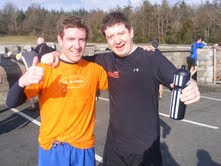 My next official race is the Craughwell 10 mile on March 14th. Rónán recently put me on to a website called http://www.mcmillanrunning.com/ (a good man to take advice from seeing as he is breaking all records lately), which can tell you what time you should be aiming for upcoming runs, based on your best run to date. Accord to mcmillanrunning (based on my Tuam 8k time) I should now aim to bring the 10 miler home in around 1 hr 25. The only difficulty I have with this logic is that I was ready to pass out after my Tuam run and I doubt I could maintain that exertion for 10 miles... However, by the same token, I did slow up considerably on the second lap of the Tuam run so perhaps a more even pace can see me home in that target time. I have also scheduled my next pints for after Craughwell, or around that weekend, though I am tempted to leave those to accumulate for Easter weekend when we are expecting visitors from the wee county. Jaysus that was tough. In my youthful drinkin' days there was fairly little justification needed for a pint but now that I've reached the ripe old age of 35 I seem to feel like I have to run up a mountain for 10km before I can have one. And just one. After the long slow incline of the woodlands we finally came to the real climb! The great Edmund Hillary may have thought nothing of this little hill but to us it was like Mount Everest. It was impossible to run so everyone trekked as best they could - a bit of runner's comaradarie does wonders to get you through and the banter was great at this stage. We went uphill and downhill for the next few kms. The view from Annacurra is breathtaking and it's easy to see why people love this mountain running lark. Descending can be pretty scary as you have no control at all and so I just decided to throw myself downill. Richie came home in an impressive 61minutes while I was way down at the bottom of the field at 72minutes. And then of course... the pint! The Saltee pub is a lovely spot at the foot of Annacurra and as well as serving some great grub it has one of the sweetest pints of Guinness you could drink - especially if you are after either walking or running a mountainy 10k! One of the owners, Noel came down to greet Richie and I, which was very nice - he had also run (and managed a whole lot better than I did!). There she is. The Saltee. That brave little Tavern at the foot of the monstrous and ignorant Wicklow Hill that will test the bejaysus out of poor Richie and I next Saturday. Through the muck and rain and ridiculously strong gale force headwind that brute of a Hill will taunt and mock us both...'You want that pint? Then earn it boys... earn it'... 'Earn it wimps'... With blood running through our socks we'll carry on no matter what doubts weigh us down... we'll carry on with one clear thought in our mind to motivate us; the Saltee, and her pint of plain. A majestic black wonder at the end of a horrendous run. The Saltee. Pint one of 24. Four days and a wicked hill run away. http://www.thesaltee.ie/.